Charlevoix Tent is a full-service event rental company offering the highest quality equipment coupled with personalized service and competitive pricing. Our main goal is simple. We work directly and collaboratively with our clients to ensure that your event is planned out to the most minute detail so everything goes precisely as planned for your next special event or occasion. From small backyard parties and barbecues to large corporate events and extravagant weddings, we service a broad area ranging throughout Northern Michigan. Whatever your specific needs, our guarantee is that we will provide a level of professionalism, quality and service that you simply cannot find anywhere else. 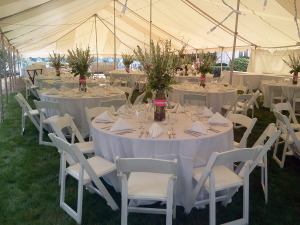 You can rely on Charlevoix Tent to create a festive and elegant atmosphere that you and your guests will never forget. Our extensive inventory includes party and wedding tents, tent heaters, a variety of tables and chairs, dancefloors and stages, fine linens, lighting and much more. We serve all of Northern Michigan, offering wedding and party rentals in Charlevoix, Petoskey, Boyne City, Gaylord, East Jordan, Torch Lake, Mackinac Island and everywhere in between. Copyright © 2019. Charlevoix Tent Company. All Rights Reserved.